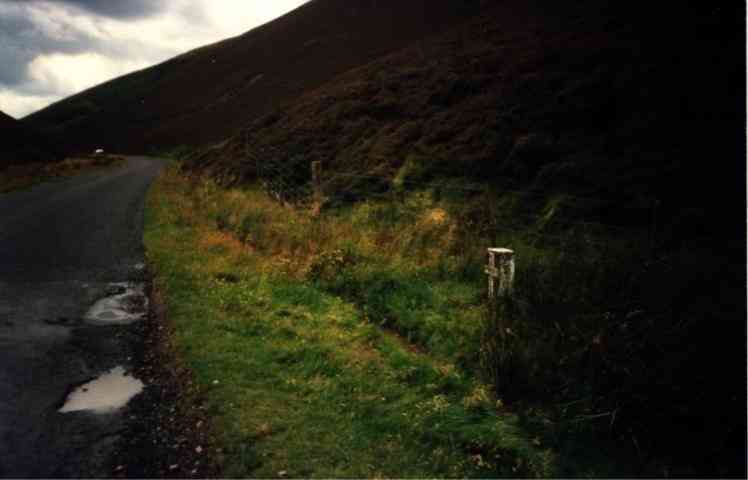 The Piper's Grave lies alongside the B709 midway between Innerleithen and Heriot. Tradition tells us that this is the last resting place of an itinerant piper who eked out his meagre living some time early in the 18th century. He was known to frequent the local hostelries taking wagers that he could play any tune that a customer could care to name. One evening after a bout of particulary riotous jollification, he chanced to remark that he could play non-stop all the way between Traquair House and Edinburgh Castle, a distance of some thirty miles, without repeating a tune. This was obviously too credulous for those present to believe and, sensing easy money, virtually everyone took up his offer of a bet. So, late that night, the motley throng set off, high on ale and expectation. Almost immediately some lost heart as the magnitude of their challenge hit them, immediately returning home to the safety of their turf fires. Others however, of sterner composition were determined to follow the piper even into the wilds of the Moorfoot Hills. It was only as the night grew wilder and the terrain more inhospitable that doubt started to creep in. The piper, obviously at home in this sort of terrain, showed no signs of flagging and, of course, he had no need eventually to retrace his steps back to the start. The whole situation was now becoming serious and subterfuge was necessary. Seizing one of the pipers unguarded moments one of the group made a hole in the windbag of his pipes. The extra effort now required to play, combined with the steep climb past Dewar, quickly drained the pipers stamina. On reaching the top of the pass he sat down exhausted, never to rise again. Here he was buried along with his pipes. And here he remains to this day. You will find his clearly marked grave on the Western verge of the road close to the county boundary. It is marked by a small black stone upon which is painted a white cross bearing the simple legend 'The Pipers Grave' but no date is suggested.